" Brad Guest Hosting 'Malloy Show' (Monday)!	" Brad Guest Hosting 'Malloy Show' (Monday)! 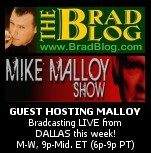 I'll be guest hosting the The Mike Malloy Show tonight through Wednesday. This time around, I'll 'Bradcasting' LIVE from AM 1360 Rational Radio in Dallas, from 9pm-Midnight ET (6p-9p PT). Please tune in! If you'd like to use your public airwaves tonight, the call-in number this week only will be: 800-277-1637, ext. 703. IGOR VOLSKY, of Center for American Progress, contributor to the book Howard Dean's Prescription for Real Healthcare Reform: How We Can Achieve Affordable Medical Care for Every American and Make Our Jobs Safer , on where the hell we are now in the ongoing fight for health care reform. FRANK SCHAEFFER, former rightwing fundamentalist leader, BRAD BLOG guest contributor, author of Crazy for God: How I Grew Up as One of the Elect, Helped Found the Religious Right, and Lived to Take All (or Almost All) of It Back and Patience with God: Faith for People Who Don't Like Religion (or Atheism) on America-hating Republicans, and his controversial case for Barack Obama. Malloy's show is nationally syndicated on a number of air affiliates around the country, also on Sirius Ch. 146 & XM Ch. 167. You may also listen online to the free LIVE audio streams here or here! HOUR 1: Igor Volsky on the good, bad and ugly of health care reform legislation. HOUR 2: Frank Schaeffer on the good, bad and ugly of Republican tea baggery and Talibanism, and on criticism of Obama from the Left. « PREVIOUS STORY "Federal Judges Halt Use of ES&S Touch-Screen Voting Systems in Dallas"
"Brad Guest Hosting 'Malloy Show' (Monday)!"